In sugarcane, there are a number of recommended management practices to prevent injury from MRB. In rice, the seed treatment Dermacor X-100 should provide control of this pest. Pyrethroids can also be used, but timing of application is critical. 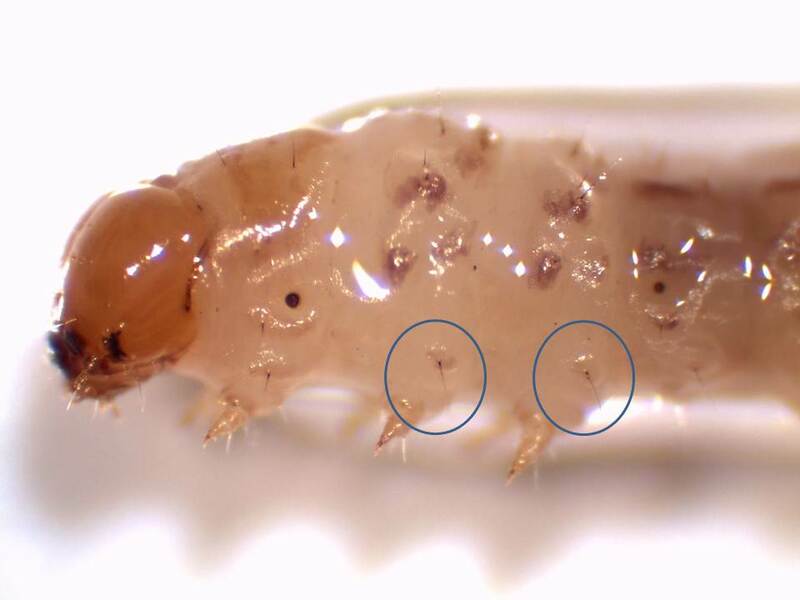 It is necessary to detect an infestation when larvae are still feeding in the sheath area. 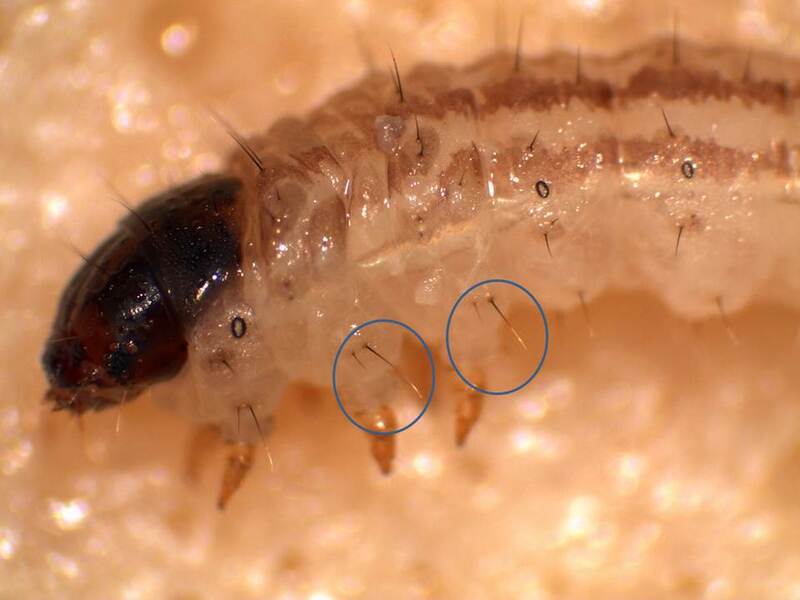 Once the larvae penetrate the stem, pyrethroid insecticides will not provide acceptable control because they are not able to come into contact with the larva. 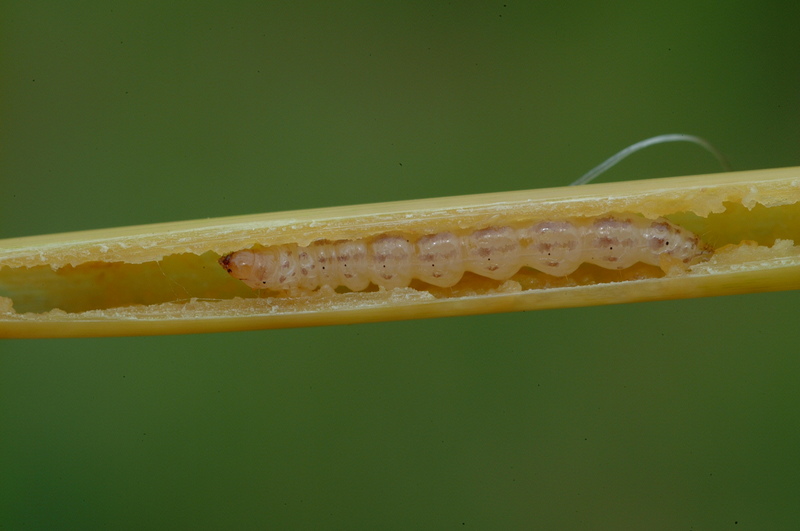 If you find a larvae in rice or cane and suspect that it is MRB, please call me and we can arrange to pick up the sample. The insect was first found in Louisiana in December 2008 north of Vinton. On Nov. 22, 2010, four male adults were found in a pheromone trap about six miles southwest of Sulphur, according to Gene Reagan, LSU AgCenter entomologist. Chris Carlton, director of the Louisiana State Arthropod Museum, confirmed that these trap catches were Mexican rice borers. “This trap location is adjacent to a grassy area where no crops are grown, and it is within 15 to 18 miles of commercial sugarcane fields south of Lake Charles,” Reagan said. Reagan’s graduate student, Julien Beuzelin, said the traps are set out by the Louisiana Department of Agriculture and Forestry. “Without their work, it would have not been possible to detect this insect’s movement,” Beuzelin said. He said the LDAF had planned to end the monitoring program in early December, but after the Nov. 22 samples were found, the department has decided to continue the program into the spring. Beuzelin said the discovery is a reliable indicator that the pest is continuing to move eastward in Louisiana. “Since first being found in south Texas in 1980, they have consistently expanded their range along the Gulf Coast,” Beuzelin said. In 2006, the Mexican rice borer was found in east Texas just one county away from Louisiana, and it was anticipated that it would be found in Louisiana in 2008. Only two weeks before the end of 2008, borers showed up in two pheromone traps five miles apart on the Louisiana-Texas line north of Vinton. A 2007 study by LSU and Texas A&M projected an annual $45 million loss of revenue for Louisiana rice farmers once the entire state is infested. The estimated damage for sugarcane is projected at up to $220 million in the next few years. Mexican rice borers are not obvious pests in rice until the crop is in the boot stage. But by the time it is found within rice plants, Reagan said, studies with Texas colleagues show that the population jumps rapidly. Reagan said that prompted the question to arise regarding the pest’s overwintering habitat. Between growing seasons, the insect is found in high numbers in grasses such as Johnsongrass and vaseygrass. Once the insect bores into sugarcane, insecticides don’t work well because the cavity created by the borer is filled with chewed plant material, frass, blocking a chemical’s entry, he said. Insecticides work better on the pest in rice, Reagan said. However, three applications may be required in some east Texas areas. A new seed treatment, Dermacor, appears to help control the pest in rice. Originally, Dermacor was developed as a seed treatment for drill-seeded rice against the rice water weevil. To learn more about Mexican Rice Borer you can visit: http://www.lsuagcenter.com/en/communications/publications/Publications+Catalog/Crops+and+Livestock/Insect+and+Disease+Control/rice/Mexican+Rice+Borer+Identification+Card.htm. The LSU AgCenter is fortunate to have a very positive working relationship with the LDAF. I want to make sure you are aware of these outreach sessions that will be attended by Commissioner Mike Strain. Below is an announcement from LDAF. In March 2010, the Louisiana Department of Agriculture and Forestry (LDAF) will host nine outreach sessions throughout Louisiana. The sessions are designed to inform the agricultural community, decision-makers and the general public about LDAF’s mission and responsibilities. The LDAF staff would like to meet you and hear your comments, questions and concerns. Based on your input, LDAF will be able to address pressing needs regarding agriculture and rural economic development in ways that will be beneficial for everyone. Commissioner Mike Strain will attend each of the sessions. Local elected officials have been invited to attend the outreach sessions to learn more about the concerns of the agricultural community how they may play a role in helping meet those needs. Monday, March 1 LDAF Monroe District Office, 6-8:00 p.m.
Wednesday, March 3 LDAF Haughton District Office, 6-8:00 p.m.
Monday, March 8 Welsh Community Center, 6-8:00 p.m.
Wednesday, March 10 Peltier Park, Thibodaux, 6-8:00 p.m.
Monday, March 15 Louisiana Emergency Shelter, Alexandria, 6-8:00 p.m.
Tuesday, March 16 LDAF Hammond District Office, 6-8:00 p.m.
Wednesday, March 17 Opelousas Civic Center/LDAF District Office, 6-8:00 p.m.
Thursday, March 18 East Jefferson Library, Metairie, 6-8:00 p.m.
Friday, March 19 LDAF Baton Rouge Office – Ag Day, 2-4:00 p.m. The LDAF wants to meet you and hear your thoughts and comments. Mark your calendars with the upcoming dates so you will not miss this opportunity! For more information, visit us on Facebook or www.ldaf.state.la.us or call Dr. Carrie Castille at 225-922-1234.